EXECUTIVE ACCESS: WaterColor guests staying at this 360 Blue property have access to 5 award-winning community pools, 2 tennis courts at both Shark's Tooth Club and at WaterColor, limited tee time access to award winning Shark's Tooth and Camp Creek Golf Courses. They also receive 20% off daily or weekly passes at the WaterColor Fitness Center and complimentary use of two kayaks or canoes for one hour per day, as well as 20% off stand up paddle boards at the WaterColor Boathouse. DETAILS: Welcome to BeachHaven at 604 Western Lake. This is gorgeous 4-bedroom, 4-bathroom home in the heart of WaterColor’s Park District is just 2.5 blocks from the beach, and just steps from Cerulean Park and the Boathouse. 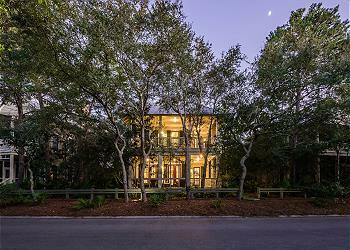 Beautifully appointed, it features walnut floors, beautiful screened-in porches, door and window transoms, along with a vibrant coastal décor. Enjoy meal preparation in the perfectly designed kitchen which offers granite countertops, stunning cabinetry and the breakfast bar with seating for 3. It opens onto the dining area with seating for 6 under a gorgeous chandelier. The living room has a gas log fireplace, a flat-screen television and plenty of comfy seating, making it the perfect place for friends and family to gather for vacation movie night. Down the hall you’ll find a guest bedroom with a king bed, flat-screen television and a private bath with a single vanity and shower and tub. Ascend the staircase to the second floor where you’ll find the master bedroom with a king bed, flat-screen television, balcony access and a connecting bathroom with a double vanity, tub and shower. A second guest bedroom also has balcony access and features a queen bed, flat-screen television and a connecting bedroom with a single vanity and a shower and tub combo. The third guest bedroom makes the perfect quarters for kids, as it offers two twin beds, each of which has a trundle, and features balcony access, a flat-screen television and a connecting bathroom with a single vanity and shower. What sets this WaterColor gem apart is the spectacular location. The beautiful outdoor spaces – including a Florida room – make it the perfect gathering spot for up to 10 guests – and it’s just a short walk to the most beautiful beaches in the world. Book this 30A getaway with 360 Blue today! we had a great time for our daughter’s senior spring break with friends - beach haven was the perfect house at our favorite beach! thank you!! We had a wonderful stay! We celebrated two 16th birthdays while we were there. We are so glad you all enjoyed your vacation and spent two birthdays with us! The photo you shared is priceless! We hope to see you again soon!